Steve Reiners will be new Horticulture Section chair. Alan Collmer, director of the School of Integrative Plant Science (SIPS), announced yesterday three SIPS leadership transitions effective August 1, 2015. Mike Scanlon, professor in the Plant Biology Section, has completed his term as Director of Undergraduate Studies (DUS). During his tenure in the postition, Scanlon streamlined the Plant Sciences curriculum, introduced new courses, and expanded concentrations to accommodate evolving student interests. As a member of the SIPS executive committee, he made key contributions to the SIPS strategic plan. Marvin Pritts, who has served as Horticulture Section chair for 13 years, will assume the DUS position. Pritts has been extensively involved with the Plant Sciences major for many years as an undergraduate adviser, as co-creator and instructor (with Marcia Eames-Sheavly) of Collaboration, Leadership, and Career Skills in the Plant Sciences (PLSCI 1110), and as an adviser for PLHRT/IARD 3200 Experiential Garden-Based Learning in Belize. Steve Reiners, professor and associate chair in the Horticulture Section, will succeed Pritts as chair. Reiners, is based at the New York Agricultural Experiment Station in Geneva, and has also served as Department Extension Leader. 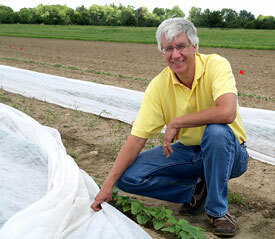 He also leads the Cornell Cooperative Extension Vegetable Program serving western New York and the Eastern New York Commercial Horticulture Program. He co-teaches Principles of Vegetable Production (PLHRT 3500) and Organic Vegetable Gardening (PLHRT 1250).